Stress in the UK banking system has intensified since Britain’s vote to leave the European Union, with the premium banks charge to lend each other short-term sterling funds doubling to its highest level in four years. The Libor-OIS spread is a gauge of banks’ willingness to lend to each other and is perhaps the most fundamental barometer of the banking system’s health. Its widening comes amid a sudden darkening of the outlook for Britain’s economy. Christopher Vecchio, Currency Strategist at DailyFX, highlights how the widening of spreads could spell warnings of broader financial stress in Reuters. The UK’s equity markets mounted a recovery of sorts this week, following a period of significant volatility and market uncertainty. While sterling remains weak against the US dollar, the FTSE 100 has recovered from a low of 5,980 on Monday to open at 6,504 on Friday morning. However, although many had priced in the risk of a potential Brexit, the extraordinary swings in GBP reflected currency traders’ worst fears. In a poll conducted by Chatsworth earlier this year, 80% of currency market professionals expected the UK to vote to remain in the EU. But when the first indications emerged that the UK would be leaving, we saw a negative contagion effect spread swiftly through the market as investors struggled to come to terms with the outcome. As a global financial capital where the vast majority of currency trading is transacted, London will be bracing itself as the rest of the EU takes stock of the result. Traders, investors and money managers can now expect a prolonged period of uncertainty – the number one bugbear for financial markets – as the UK takes a step into the unknown. FXCM’s Sentiment Index has tracked the trading activity of 180,000 retail FX traders and shows how traders positioned themselves in GBP/JPY, EUR/USD and GBP/USD currency pairs in the run-up to the UK referendum. In the past few weeks, traders became more inclined to buy the pound against the yen and the dollar. Around the week of the 6th June the index showed a big jump across all three currency pairs and there’s been significant volatility in each pair. FXCM anticipates a lot more volatility as voting gets underway and is raising margin requirements again, so the data from the Sentiment Index provides a good insight into how traders could potentially position themselves. Back in April, Chatsworth’s research team polled over 12,000 members of the ACI Financial Markets Association, the largest global trade body representing the international currency markets, for their personal views ahead of the UK Referendum vote on 23 June. Two-thirds (65%) of respondents believed a UK vote to leave the EU would negatively affect London’s position as the world’s largest FX trading centre, while 13% believed a Brexit would have a positive impact. The outcome of the EU Referendum vote on June 23 is the largest risk event for international currency markets so far this year. With the polls too close to call, no clear direction as to the outcome and currency market reacting in a volatile fashion to any indicators, increasing uncertainty is leading to a reduction in liquidity. All this has triggered a flight to safety and investor trepidation about how the outcome of the vote might affect trading positions and portfolios. This period will also act as a test for brokers, trading platforms and infrastructure operators. Following last year’s surprise decision by the Swiss National Bank to remove its currency peg against the Euro, some market participants recognised they were unprepared for the unexpected move in EUR/CHF that followed. However, the lessons have been learned and technology and risk protocols have been upgraded and adapted. Market participants are now better prepared for an explosion of volatility and are likely to err on the side of caution in the face of significantly higher trading activity following the EU Referendum vote. What continues to largely remain unaddressed from last year is the ability for traders to execute trades effectively during times of extreme volatility, and limiting instances of disruptive trading behaviour. This will be crucial if some participants seek to gain a latency advantage for nefarious purposes while others seek exit or adjust their positions, realise hedges or seek to identify profitable strategies. This is where ParFX has a unique advantage. Our platform was developed in conjunction with some of the largest market participants, and the stability and firmness of prices that participants see on ParFX and the ability to execute on these prices is one of the platform’s primary principles. We have protocols and mechanisms in place to enable this to happen, such as randomised order entry, full trading transparency and the distribution of market data in parallel. This ensures participants in our trading environment operate on an equal playing field, while instances of latency-led disruptive behavior occurring is reduced significantly. What a manic Monday. We’re looking at the Pound’s biggest single-day jump in nearly six years. Sterling rallied following as opinion polls suggesting a swing in favour of voters opting to remain in the European Union at this week’s referendum.The pound climbed 1.4pc to USD 1.4560 after rising as high as USD 1.4625 earlier, sending the perceived safe-haven yen down. The implied probability of a Remain vote in Thursday’s referendum rose to 72 percent after falling as low as 60 percent last Thursday, according to odds from gambling website Betfair. The 23 June referendum is still wide open, however, but the leave no longer seems the overwhelmingly likely scenario. To read further insight from the DailyFX team on the market impact of a potential Brexit and other currencies movements, visit the website. It can be difficult at times to separate the hype that surrounds big data from the reality. Nevertheless, big data will continue to transform how companies operate. Whereas in the past data was often the by-product of an operational process, it is now the primary asset that drives business decisions. What specifically will it mean for investment banks? Diane Castelino PH.D, Data Science and Research Lead At Mosaic Smart Data takes a look at how this technology can be applied to the financial services industry in the second of her series on the practical application of new and emerging technologies. Will a Brexit damage the City? With less than two weeks to go, the debate on whether the UK should remain or leave the European Union is heating up. Now with the Financial Times Brexit poll tracker indicating a slim lead for the leave camp, it’s hard to tell which way the referendum will go. However, a growing number of bankers are warning of the possible damage a Brexit could cause to the City of London and the financial services sector. According to an article published on the Financial Times website, the City employs 2.2 million people across the UK. If the UK were to leave the EU, then it would no longer be possible for non-EU firms to headquarter European operations in London and continue to trade across the union without barriers. A Leave vote would likely see offices opened in Paris or Frankfurt whilst non-EU firm UK offices would be downsized, potentially putting jobs at risk. http://www.chatsworthcommunications.com/wp-content/uploads/2016/03/The-UK-EU-Referendum-2.jpg 392 1000 ChatsworthCommunications http://www.chatsworthcommunications.com/wp-content/uploads/2015/09/cc-Logo-FC2.png ChatsworthCommunications2016-06-15 09:57:152016-06-17 09:19:50Will a Brexit damage the City? Why is FinTech innovation in London gaining traction compared to other areas of the world? London is almost perfectly positioned at the intersection of finance and technology. In the last 24 months, the Capital has acted as a hotbed for venture capital investment for a variety of FinTech firms pioneering new technologies designed to disrupt traditional business models, but also to enhance existing ones through collaborative partnerships with established financial services providers. Which areas of financial services have been most impacted by FinTech development? Within the fintech sector, the field of data analytics has quickly become the new opportunity in financial markets. The ability for financial institutions to move beyond the realm of ‘big data’ by applying real-time analytics on multiple sources of electronic trade data is already providing the most technologically astute banks, hedge funds and asset managers with significant competitive advantage. However it is the ability to harness predictive analytics that remains at the cutting edge. Much of this capability already exists and is being used to considerable effect, especially by technology giants such as Google and Facebook. The technology will allow financial institutions such as banks to gain deeper insight into client trading behaviour, ensure higher levels of client retention and shape product and services offering to maximise future revenue opportunities. Gartner, a Harvard research institute has predicted that by 2017, firms with predictive analytics in place will be 20% more profitable than those without. For some traditional companies is it purely a case of ‘adoption’ rather than ‘disruption’ behind rise of the fintech sector? The financial technology market has exploded in recent years. Innovation is driving major improvements in the level of service experienced by the end user, however when it comes to financial services, businesses are naturally more wary of the type of ’disruptive’ technology that has transformed other areas of our day-to-day lives such as calling a cab or booking holiday accommodation – after all, we can always call another cab if our Uber doesn’t turn up, but if a billion dollar payment doesn’t reach its intended recipient we have a much more complicated issue on our hands. The institutional financial services space is much more about collaboration between fintech firms and established players – it is this combined firepower that delivers truly sustainable technological innovation. Should investment banks or lenders move to disrupt their own business model to avoid losing market share? Many traditional service providers such as global investment banks are coming to the realization that they need to partner with emerging innovators. As such, finance and technology has become synonymous, and data analytics, in particular, is moving to the forefront of efforts to provide new solutions to on-going market challenges. However, for large players such as global investment banks, the integration of new and specialist fintech solutions should be implemented on a modular basis to work in collaboration with existing systems. In many cases, the reality of effective integration is one of evolution, rather than revolution. The constitution of the FX market is changing – it is no longer the exclusive preserve of banks, with a non-bank prop fund breaking into the top 10 for the first time, despite solid continuing performances from City, JP Morgan and UBS. The release of Euromoney’s annual FX rankings for 2016 showed some significant changes in the performance of global banks at the top flight of the table, but also the rise of non-bank challengers such as XTX Markets, which secured 9th position ahead of Morgan Stanley, with a 3.87% market share on debut. Relative to competition from other major banks, Citi strengthened its position with a 4% lead at the top of the table, despite an overall year-on-year decline in comparison to its 2015 figures. This decline in volume was mirrored across the top 5 global banks, as FX trading divisions struggle to tackle growing compliance and cost challenges. Over a 7-year period, combined market share among this group has fallen almost 17% from a high of 61.5% in 2009. Deutsche Bank continues to undergo restructuring and cost cutting and suffered heavy falls across FX Spot and FX Forward markets, while retaining its crown in the FX Options market. Overall, the bank fell from second to fourth, losing almost half if its 2015 market share. As many banks continue to face balance sheet pressures and the constraints of capital requirement rules, non-bank liquidity providers have in many cases flourished. Beside major gains by XTX Markets, Tower Research Capital, Jump Trading, Virtu Financial, Lucid Markets and Citadel Securities all secured a top 50 ranking. According to Euromoney, total volumes taken into account for the 2016 rankings amounted to almost USD 95 trillion. Foreign exchange settlement volume from Chatsworth Client, CLS, hit USD 4.96 trillion in April, up 5.7% from the previous month, and up 6.9% from the USD 4.64 trillion in April 2015. FX-MM explores the changing nature of trading volumes, strategies and technology in foreign exchange (FX), as investors face dwindling returns in other asset classes. As part of the article, Roger Rutherford, Chief Operating Officer at ParFX, analyses the growth of electronic trading in spot FX, whilst sharing his thoughts on future market and technology trends. He also highlights the corrosive impact of disruptive high frequency trading on the ability for market participants to execute efficiently, before emphasising the need for a truly level playing field in foreign exchange. David Mechner, CEO of Pragma Securities, also provided insight into the role and value of algorithmic trading in currency markets. Greenwich Associates has published an interesting report covering the changing nature of liquidity provision in the global foreign exchange (FX) market, as well as the impact of macroeconomic and regulatory factors in driving a market structure evolution. The paper, entitled Diversifying Liquidity: Attaining Best Execution in FX Trading, highlighted the continuing growth of non-bank liquidity providers, with the largest FX dealers executing less than half of global buy-side FX volume. However, despite the growth of competition from non-bank liquidity providers and the challenges posed by incoming regulatory requirements, interviews with over 1,600 top-tier foreign exchange users globally found that the world’s largest dealers are expected to continue to play a major role in facilitating FX trading. The report also noted growing demand for a more granular understanding of best execution by utilising sophisticated transaction cost analysis (TCA) tools to analyse existing trading relationships and engage with new counterparties. The rise of electronic execution and the subsequent decline of voice brokerage was also striking, with a 32% jump in buy-side trading handled by multi-dealer trading platforms and a 50% reduction in phone-traded volume since 2008. These changes contributed to an overall growth in electronic trading, which now accounts for 73% of all FX volume executed annually. 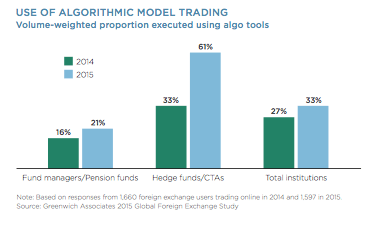 In line with the growth of electronic trading, a jump in the adoption of FX algorithmic trading amongst the hedge-fund community was particularly notable. From 2014-15, automated execution amongst this group of traders almost doubled from 33% to 61%; in contrast, the growth in adoption rates for fund managers and pension funds showed a mere 5% rise over the same period. A one billion euro project, announced by the European Commission aims to develop quantum technologies over the next 10 years to place Europe at the forefront of this emerging technology. Quantum computers have been hailed for their revolutionary potential in everything from space exploration to cancer treatment and financial markets. Unlike conventional computers, quantum computers process data in parallel, mimicking, if you like, the human brain. A quantum computer can recreate the behaviour of atoms, model chemical reactions and simulate nature itself, making it capable of large-scale simultaneous computation. Newsweek magazine spoke with Chatsworth client, Cambridge Quantum Computing (CQCL) about the European Commission’s commitment to the technology, as well the work it is doing to develop a quantum operating system called t|ket>. The prospect of a merger between exchange powerhouses, the London Stock Exchange Group (LSEG) and Deutsche Börse could usher in an era of mega-exchanges, where a handful of providers dominate equity, derivative, fixed income, indices and clearing markets in specific geographies – making them a one stop shop for the entire trade cycle. Yet the road to that reality is certainly a long one. The unravelling of negotiations between these two trading behemoths to secure a deal in 2000 and again in 2005, demonstrates all to clearly the challenge that lies ahead. Moreover, possible legal hurdles put in place by anti-trust authorities, combined with political and economic uncertainty surrounding a British exit from the European Union, could yet prove terminal. The rationale behind this potential corporate marriage is clear. In a statement issued by the LSEG announcing the talks, the Group pointed to “the prospect of enhanced growth, significant customer benefits including cross-margining between listed and OTC derivatives clearing.” The move, which would allow both firms to pool capital, resources and expertise to grow market share and cut operational costs is also consistent with the LSE’s long-term strategy under the leadership of CEO, Xavier Rolet. Rolet’s commitment to strengthen the Group by completing a string of acquisitions to diversify its offering in the derivatives, indices and clearing market has paid dividends. The purchase of indices providers Russell Group and FTSE in quick succession, as well as a majority stake in LCH Clearnet, one of the largest interdealer clearing houses, has affirmed the group’s position in Europe as a leading provider of trade execution, clearing and data related services. This strategy has led to a dramatic rise in market capitalisation by as much as fivefold and also transformed the group from being preyed upon by rival firms, to a predator seeking to grow market share, according to a recent article on the proposed deal in the Financial Times. However, US exchanges are increasingly seeking to secure a global, rather than continental footprint with a move into European Markets. BATS Global Markets, a US operator, now runs the biggest stock exchange in Europe by market share – whilst CME, the Chicago-based group, launched in European markets in 2012 with a multi-asset derivatives offering spanning trading and clearing services – posing a direct challenge to incumbent operators. Against this backdrop, it is clear to see why these two institutions are seeking to pool capital, technology and people to compete directly with global exchanges, particularly from the US. It is well known that this drive towards exchange consolidation is likely to result in a small number of major operators, reducing market fragmentation, something noted by Rolet in 2011. “In five years there’ll be three, four international exchange groups with global distribution capabilities,” he said in an article in the Telegraph. Whilst the rationale behind a potential merger has commercial objectives, it is also likely to deliver cost synergies, particularly for core customers such as large investment banks and asset managers. For example, the introduction of new regulation designed to implement greater risk controls on global derivatives markets has placed steeper margin requirements on banks – creating a glut of capital warehoused in major clearing providers such as LCH Clearnet and Eurex Clearing. Whilst the LSEG statement specifically noted that both firms would remain as separate entities, a merger could allow banks with portfolios in each CCP to reduce net margins and free up capital that can be used more profitably elsewhere. Whilst a deal will deliver greater operational efficiencies to LSEG, Deutsche Börse and their respective customers, it is likely to trigger further consolidation as smaller exchanges rush to pool resources and as a result, introduce a new era dominated by a handful of major global players. http://www.chatsworthcommunications.com/wp-content/uploads/2016/02/Fotolia_73155469_Subscription_Monthly_M.jpg 1078 1763 ChatsworthCommunications http://www.chatsworthcommunications.com/wp-content/uploads/2015/09/cc-Logo-FC2.png ChatsworthCommunications2016-02-25 14:10:082016-03-03 09:20:00Survival of the biggest: A new era of mega-exchanges on the horizon? Chatsworth was delighted to share an evening with a remarkable and talented group of people brought together at Bloomberg Innovators 2016 yesterday evening. The shared DNA of each business seemed to be the energy levels, levels of staff engagement and love for what they do. Not to mention an intense focus on the product, customer service and the desire to shake up the incumbent competition or best it. We were there with the team from Cambridge Quantum Computing to celebrate their I recognition as one of the top 50 innovators of 2016. Full marks to the SevenHills team and Bloomberg’s Nate Lanxon for pulling the evening together and helming a great event. The news, reported in the Financial Times, that nine major banks have formed a partnership to invest in and explore the potential for digital ledgers in wholesale financial market is game-changing stuff. Chatsworth client, R3, has brought together some of the sharpest minds from across electronic financial markets, digital currencies and cryptology with the backing of banks including JPMorgan, Barclays, UBS and Credit Suisse. The creation of digital currencies like Bitcoin have attracted considerable attention. But it is the distributed ledgers underlying these payment systems which look to be the significant innovation. Distributed ledgers allow for the distribution, verification and record keeping of transaction information. As most financial assets today of course exist only as digital records, distributed ledgers could be applied to wholesale financial markets to transform the way records are kept, queries and reported. There has been a feeding frenzy of interest and outside investment in applying the technologies developed to drive digital currencies to financial markets, but so far they all appear to lack understanding of the problems they hope to solve and an infatuation with immature technology for its own sake. The R3 project stands out as the first serious commitment by the banks to work towards a common understanding of how best apply this emerging technology to the global financial system. Distributed ledger technologies may well transform financial markets but the technology and standards must be secure, scalable and adaptable. The R3 project includes a collaborative lab environment or “sandbox” to test and validate distributed ledger prototypes and protocols. Success needs a highly scientific and methodical approach with understanding and careful analysis of the sector and the problems which need to be solved, before the development and deployment of a financial-grade shared ledger solution. It is not just the number and size of banks and the scale of their investment which sets the R3 project apart. It is collegiate approach to defining what success looks like and then building it the right way.